Millennials say the key advantages of public transportation are the ability to pay-per-use (58 percent), protecting the environment (50 percent), the ability to socialize online (44 percent), and creating community (44 percent). A report done by the Frontier Group and U.S. PIRG in April 2012 also found that from 2001 to 2009, the miles driven by young people (16 to 34 years-old) decreased from 12,800 miles to 10,700 miles with a simultaneous increase in rail and bus use. In addition, from 2000 to 2010, the number of young people who do NOT have a driver’s license increased from 21 percent to 26 percent. Americans drive fewer total miles today than we did eight years ago, and fewer per person than we did at the end of Bill Clinton’s first term. The unique combination of conditions that fueled the Driving Boom—from cheap gas prices to the rapid expansion of the workforce during the Baby Boom generation—no longer exists. This is one of the most compelling arguments for why we should expect America’s declining interest in cars to be permanent…. communication technology is replacing a lot of errands that the older generation is used to doing with cars. Locally, multi-modalism is on the rise. 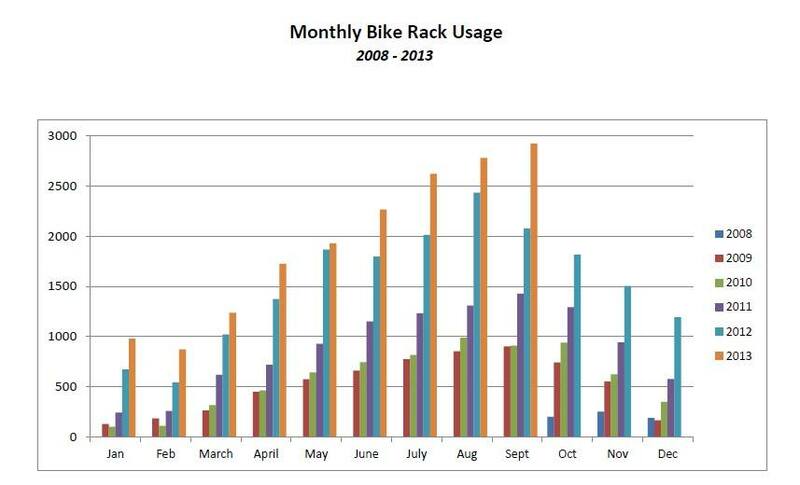 One indicator–bike rack use on the bus–has been growing exponentially over the past five years as shown in this 2008 – 2013 Bike Rack Charts report from Omaha Metro. This is a clear indication that people in Omaha are using multiple modes to get around town and if you build it, people will use it. The benefits are many, including job access, economic development, congestion reduction, road and parking facility savings, and improved safety and health. It also means freedom, opportunity and autonomy. It’s certainly key to attracting the next generation workforce. What do we need to do in Omaha to make this happen? We could start by adopting a Complete Streets policy and using transportation dollars more wisely by investing in multi-modal strategies shown to improve economic development and reduce costs.